When my daughter Harlow was born it never even crossed my mind that she might ever have jaundice. My son didn't have it when he was born so why should my daughter? Well, she was jaundice which wasn't a massive deal however I realised I didn't actually know what being jaundice meant apart from the fact your skin and the whites of your eyes were a bit yellow. So for the benefit of all the other mothers out there with babies who have jaundice (and possibly breastfeeding) here's a little bit more info about the condition. First of all, what is jaundice? Here's how the NHS describe is: "Jaundice is caused by the build-up of bilirubin in the blood. Bilirubin is a yellow substance produced when red blood cells are broken down. Jaundice is common in newborn babies because babies have a high level of red blood cells in their blood and these are broken down and replaced frequently. The liver in newborn babies is also not fully developed, so it is less effective at removing the bilirubin from the blood. By the time a baby is about two weeks old, their liver is more effective at processing bilirubin, so jaundice often corrects itself by this age without causing any harm. In a small number of cases, jaundice can be the sign of an underlying health condition. 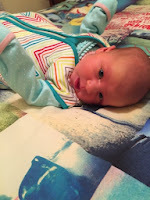 This is often the case if jaundice develops shortly after birth (within the first 24 hours)." Harlow looking a bit yellow at 4 days old. 1. Yellowing of the skin and whites of the eyes. 2. Yellowing of the palms or soles of feet. 3. Dark/ yellow urine (a newborn baby's urine should be colourless). 4. Pale coloured poo instead of yellow. Normally after around two weeks babies should start to show less symptoms of jaundice and it gradually rectifies itself on it's own. For reasons that are unclear, breastfeeding a baby increases the risk of them developing jaundice, which can often last for a month or longer. This seems to have happened to Harlow as although she's almost seven weeks she still has a slight tinge to her skin. The health profession do say though that in most cases the benefits of breastfeeding far outweigh any risks associated with jaundice. 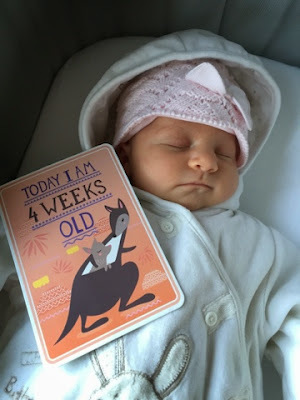 When I visited the health visitors at my local clinic to have Harlow weighed when she was three weeks five days old, they did advise that if she was still quite yellow at four weeks old then it would be best to have a doctor take a look at her just in case. So when four weeks came she still looked yellow so I called the doctors and made an appointment for first thing that morning. The doctor was great and gave her a thorough check up with lots of questions for myself and the other half. 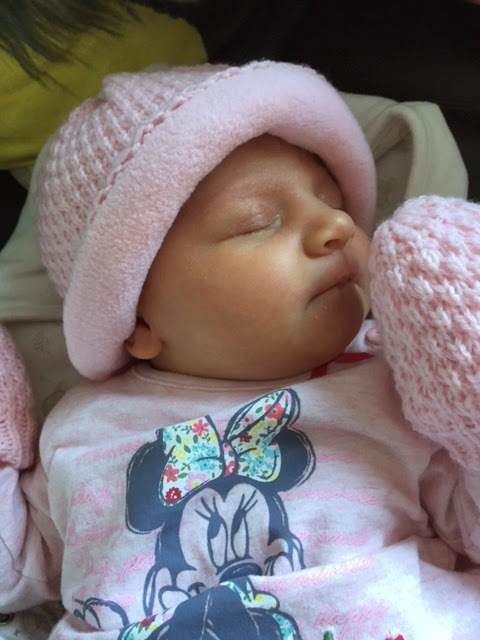 All seemed fine with little Harlow but just to be on the safe side the doctor informed us she would call the local children's hospital to see what advice they would give. Around mid morning that day I received a phone call from the children's hospital asking the other half and I to bring Harlow in for a blood test, better safe than sorry. Off we trotted to have her blood taken and let me tell you she was not happy about that, poor lamb. It was a simple heel prick but since she's so little it took a bit longer to get the required amount of blood and she did not like having her heel squeezed. 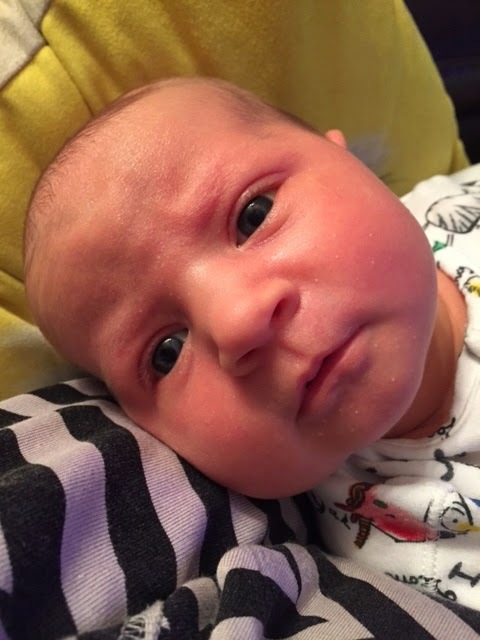 Later on that same day in the afternoon the blood results came back and the nurse phoned to inform us that yes the levels of jaundice were still a bit high but that they weren't concerned as such and it was still probably due to her being a breast fed baby. I was to continue with the breastfeeding and just make sure that the levels of jaundice were continuing to go down i.e. she was getting less and less yellow by the weeks. Harlow is almost seven weeks now and thankfully the whites of her eyes are no longer yellow and her skin is starting to turn more towards pink than yellow. 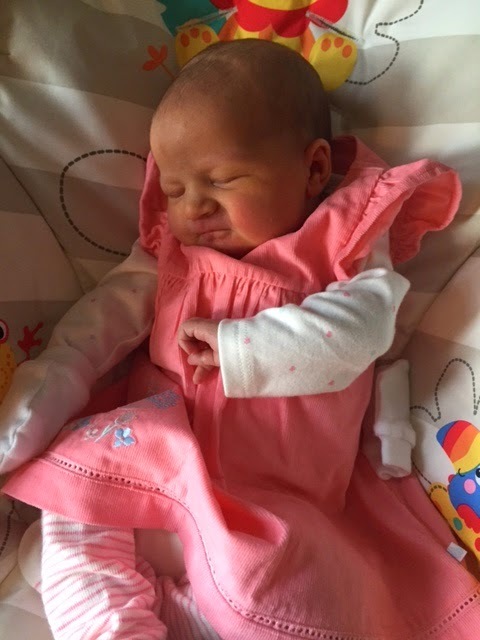 The health visitors seem happy with her so fingers crossed the jaundice will completely clear up soon. Harlow looking super yellow at 11 days old. 1. An underactive thyroid gland (hypothyroidism) – where the thyroid gland does not produce enough hormones. 2. Blood group incompatibility – when the mother and baby have different blood types, and these are mixed during the pregnancy or the birth. 3. Rhesus factor disease – a condition that can occur if the mother has rhesus-negative blood and the baby has rhesus-positive blood. 4. An inherited enzyme deficiency) – such as a deficiency of glucose-6-phosphate-dehydrogenase (G-6-PD), an enzyme that helps red blood cells function. 5. A urinary tract infection. 6. Crigler-Najjar syndrome – an inherited condition that adversely affects the enzyme responsible for processing bilirubin, leading to a build-up of bilirubin. 7. An obstruction or defect in the biliary system. 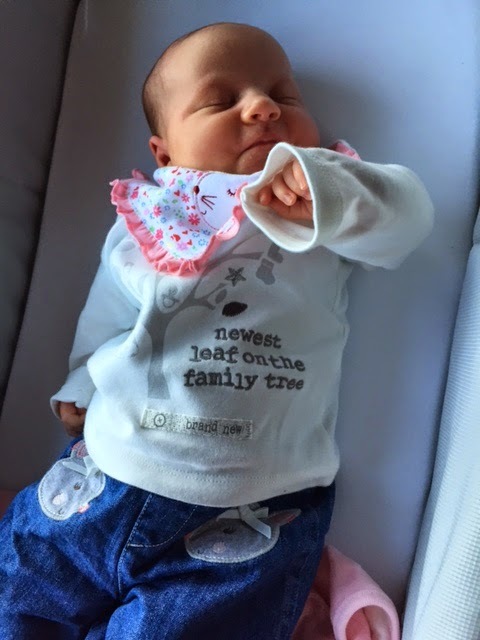 I think the best advice I could give to any parent with a newborn who has jaundice is to keep an eye on it weekly and visit the health visitors to ask for their advice. Try not to worry if it's not clearing quickly, especially if breastfeeding. If you are concerned you can book a doctors appointment for your little one and ask to be referred for blood tests. I'm glad we had Harlow checked over, the sooner the doctors pick something up the better for your baby as treatment can start asap. Today I have a lovely Mumpreneur feature for you from Polly, one of the mums behind the Cuddeldry Apron Towel. Polly has been kind enough to spare some of her busy time and tell us all about her journey. Check out the Cuddledry Apron Towel at www.cuddledry.com. Hi – I’m a mum to three gorgeous (Most of the time J) girls – Maddy aged 9, Sarah aged 7 and Reya aged 5. They do loads of different activies after school so after a full day working for Cuddledry, life steps up another couple of gears at 3 or 4pm as we dash around the region to meet various deadlines to get different girls to different activities with the right kit! All working mums will understand this! Married to my lovely husband Marshy (or Nigel to grown ups) who runs a sports hospitality company and we live in Quantock Hills, Somerset, with various chickens, dog, cat, fish – happy very busy family. 2. What's the story behind Cuddledry? Helen and her family, along with several other friends’ families, were staying at my house to celebrate my daughters’ first birthday (Maddy), 8 years ago. The children all had a bath together after tea, which the dad’s were in charge of, while the mums chatted and watched, amused as all the husbands struggled in exactly the same way as we always did – trying to hold up a towel in their teeth or under their chin, whilst simultaneously trying to pick up a slippery wet baby. Most towels (and most dads) ended up soaked, as the babies cried to be cuddled warm and dry. All the mums said the same thing happened to everyone they knew too - Helen and I agreed if only there was some way the towels could tie around the adults neck, then all these issues would go away. We spent two weeks searching for something on line (we never dreamt for a moment that there was nothing out there already) to find such an “apron style” towel, to no avail. After the shock of discovering there was nothing out there to suit our needs (and everyone else’s needs as by then we had asked everyone we knew and everybody said it was the same struggle for them at bathtime), we decided to make one. So there followed a couple of hilarious trials with us cutting up sheets to find the best design, and using a teddy as a demo baby…. until eventually we settled on the simplest design – which is still the same one we have today. 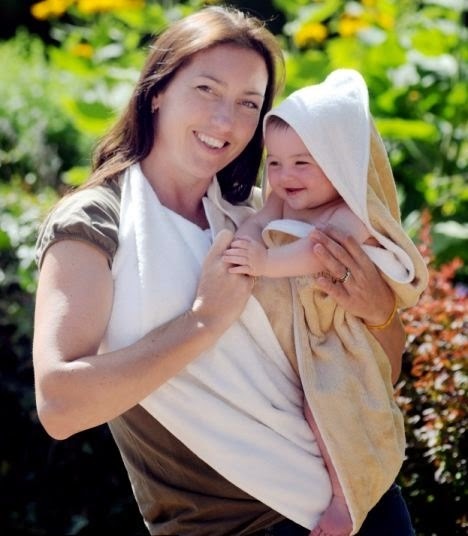 Easy pull release on the shoulder so parents can safely hold baby at the same time as undoing the poppers (no fiddling behind the neck or waist, juggling baby with one hand), no other unnecessary straps or attachments to complicate things or make life difficult. We made it big. Massive in fact. It’s the size of an adults bath towel - so it lasts and lasts, rather than regular baby towels (which only last a couple of months). 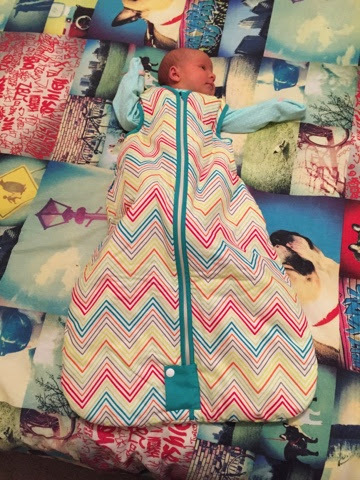 We also made it double layered for two reasons – 1- to ensure parents stay dry, and 2 – to trap air/insulation so it’s super warm for babies to snuggle into. It’s simple – pick up baby and cuddle them dry in your arms. Everyone is happy. And finally – it’s made using bamboo blended with cotton – for several reasons. 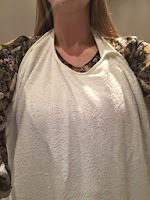 1 – it’s super soft and does not go rough like cotton towels can – great for babies skin – and it’s warmer too. 2 – Bamboo is 60% more absorbant than cotton so perfect for drying hair and skin – no need to rub, just cuddle. 3 – Bamboo is naturally anti-bacterial so great for newborns. 4 Bamboo is the most sustainable crop on the planet so it’s eco-friendly too. There is nothing but great things to say about this towel – it’s simply a must-have item for all new parents. And all new parents agree as voted by mumsnet for the last 7 years on the trot! Yes – many. Neither of us had ever run a retail brand before so we learnt as we went along. There is a lot to learn and we asked for as much advise as possible to help us. We had to learn fast – about Intellectual Property, Import/Export, VAT, social/ethical compliance, manufacturing and supply chains, logistics and distribution etc..etc... Luckily we did know a thing or two about marketing, but another problem was we didn’t have big budgets to promote ourselves and we wanted to build the brand without taking on any risk or debt. So do you give away some of your equity to achieve the money needed for big media campaign? We took a decision not to and to do the best we could with what we had, as well as using the power of word of mouth. Social media is growing – the modern day word of mouth. Word of mouth and users who constantly buy Cuddledry towels as gifts for all their friends is superb. We have such a strong fan base and it’s great to hear so much feedback from parents writing in to tell us how Cuddledry has made their life so much simpler at bathtime. We used our common sense and our judgement as parents as well as business women. We aren’t ruthless business women, and we want to retain that work/life balance always – babies grow up too quick and we don’t want to miss out. We truly want to make all parents to benefit from the happy memories and simple bathtimes Cuddledry can offer. 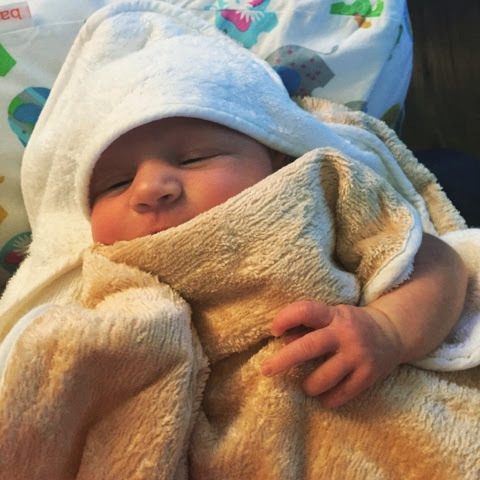 We wish we had loads of money for advertising and promotions – there are still a lot of parents out there who have not heard of Cuddledry towels, and it’s sad because they are really missing out. 5. What keeps you motivated as businesswomen? Hearing such lovely feedback from parents or midwives/nannies and nursery care workers - knowing how much Cuddledry towels have changed the lives of many new parents. It’s truly a great product and we want every parent to experience safe, simple happy bathtimes with baby. In addition, we have created more unique, practical, innovative products for bath, swim and beach. Our new hair towels are taking the swimming world by storm! Every single child in my local swim club now wears a Cuddletwist after swimming (and I’ve said nothing about what I do for a living I promise!). Parents just love the fact there are no more wet clothes, and their children have nice warm heads wrapped up all the way home. 15 children leaving a swimming pool with cuddletwists on - that’s always motivating to see! Make sure you test your idea. Whatever it is – make sure it’s not just you that thinks it’s marvellous. Take criticism seriously – and gratefully - you can change a negative into a positive if you listen. Ask for as much help and advise as you can – again, it’s about listening to people who are in the business and have experience and often know answers that may take you years of mistakes to learn. Having said that – if you receive conflicting advice, go with your gut feel. So called “experts” are not always what they are bigged up to be. But the more you ask, and the more you listen, the better decisions you will be able to make for yourself. Also having a business partner is crucial to both Helen and I because there will be times when you want to cry with disappointment, when you want to scream with frustration, and when you want to leap about with joy – and it helps to have someone to share all of that with! 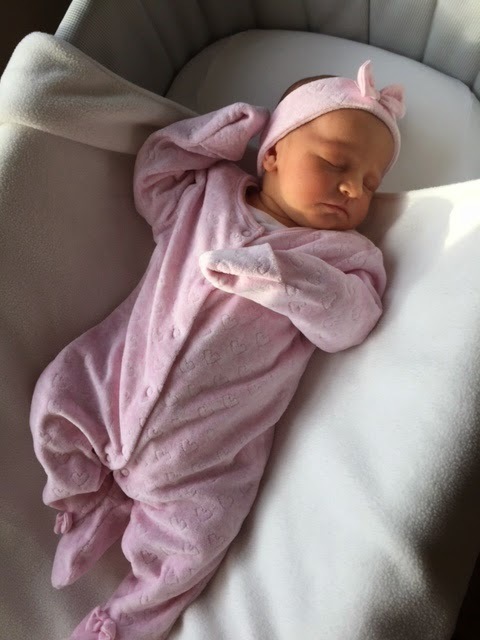 Baby bath time is both an exciting and daunting experience for new parents and even if you've had children before it always takes a few goes to get back into the swing of bathing a newborn. Not all new babies enjoy bath time either as it can leave them feeling a bit vulnerable with no clothes on so anything to make bathing easier and more efficient is a winner with me. 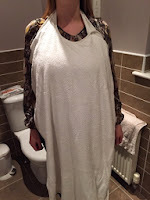 Luckily for us Harlow and I have been given the opportunity to try out the original Cuddledry Apron Towel so here's what we thought. A bit about Cuddledry: "The Cuddledry concept was founded by Helen Wooldridge and Polly Marsh, two long term friends, now working mums. Their first product was the Cuddledry baby bath towel - now a multiple award-winner and a 'must-have' for all new mums and dads. 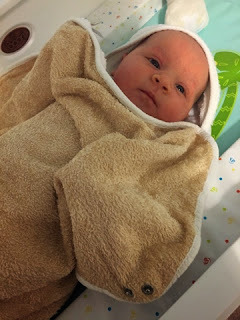 They discovered through their own experience that learning how to take care of your newborn was stressful enough, without the extra slippery problems associated with getting your precious wriggling bundle safely out of the bath! Most baby towels are lightweight squares, which parents have to hold awkwardly under their chin or between teeth in order to have two hands free to lift baby. Helen and Polly came up with Cuddledry to make the bath exit a bonding time, not a stress!" Well let me just tell you now to forget other baby towels, the Cuddledry Apron Towel is the only baby towel you should be purchasing. It's super soft and really easy to use, especially whilst trying to juggle a slippery wet baby. You just wrap the strap round your neck, push in the poppers and hay presto you're wearing a towel apron. It's then really easy to use both hands to bath your baby and securely pick up your baby when bath time is over and wrap in the towel to dry. It also stops you from getting soggy wet clothes which is a bonus. The towel is huge so keeps your baby warm and snug plus it has a good weight to it which helps baby feel safe and secure. Harlow likes going in the bath but cries coming out as I think she feels a bit exposed but as soon as I wrap her in the Cuddledry towel she settles immediately. I used Cuddledry towels when my son was little and I always felt that when he got older other baby towels just didn't cut it and were too small so he would cried as he would get cold. Not with this bad boy though, there's plenty of towel going around to keep your baby warm. So the Cuddeldry Apron Towel retails at £29.99 which is expensive however the amount of times you'll use this towel will definitely see you getting your monies worth and I guarantee you'll probably end up buying a second one. It washes really well too and always comes out just as soft and fluffy as when first bought. Overall I highly recommend these towels. 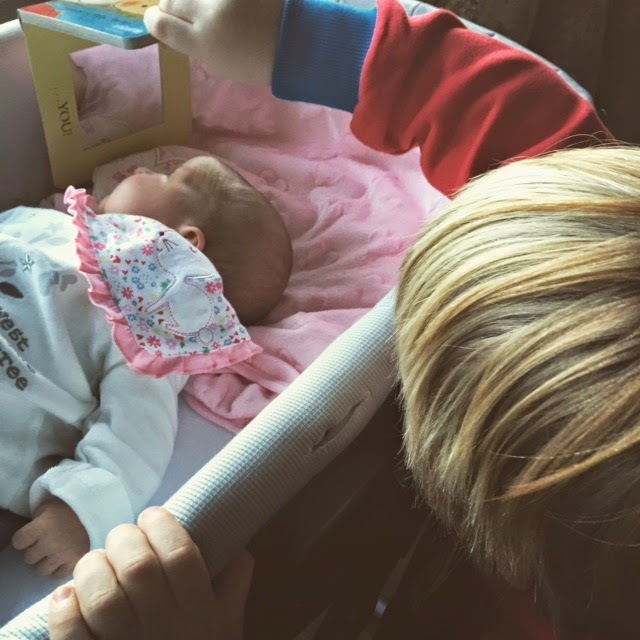 It's by far the best baby purchase I ever made when my son was little and Harlow's been lucky enough to receive one to review. If you buy it for a new baby or expectant mum they'll love you forever, it would be a great gift to receive. I was provided with one original Cuddledry Apron Towel in order for me to conduct this review. All opinions are my own. Shaving really is the bane of my life and with such a hectic busy schedule I seem to find more and more that I rarely have time to pamper myself or even simply time to manage the hair growth! I even struggle to remember to include razors for myself in the monthly grocery shop and having just had a baby my brain is mush, there might be no hope left! That is until Bearded Colonel asked if I'd like to review their razor blade subscription service. So "razor blade subscription service!?" I hear you say? Well yes, simply put that's what the Bearded Colonel are offering. With people having such busy lives these days, having blades delivered to your house so you don't forget to shave is actually quite genius. There's nothing worse when you want to shave and find you don't have any blades left. How does it work then? Well you pick the frequency of when you would like your razor blades delivered, either every month, every 2 months or every 3 months. You then receive your blades in the post (you get 4 fresh blades with every delivery), and by the way shipping is free, and lastly you get to enjoy a nice shave. It really is as simple as that and there's no commitment to stay with Bearded Colonel, you can stay with them for as long or as short as you like. The razor blades themselves are actually really really good. Because I received one handle and 4 blades to test and review my other half was able to test out the blades for me as well. It's always nice to get a man's opinion now and again! 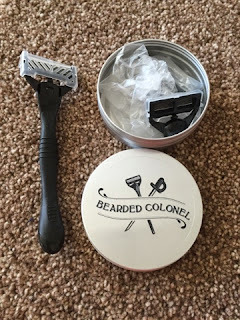 Here's what Bearded Colonel have to say about their product first: "Our blades use the Gothic Arch II, a technology that is unique to our partners. But for a top shave, you’ll need more than just the best blades on the market; you need the right handle. Simple yet effective, the handle is a sandwich of metal and rubber. The rubber underside insures good grip. A solid metal core gives the handle added weight for extra stability, reducing the chances of cuts. The top layer is textured metal, allowing your thumb to grip the handle without sacrificing mobility, helping you get that much more precision. The real coup de grace lies in the shape. The slight curve is designed to fit with the natural curve of your fingers making the handle an extension of your hand. By the way, the handle is on us!" The other half and I both agree that these razor blades are something special. I normally have to shave my under arms every other day but with these blades it was every 3 days which is great and saves me some time of course. Although my other half sports a nice beard he's quite hairy so likes to have his neck smooth and hair free. He's commented on what a really close shave these blades have given him and they haven't left his skin dry or itchy. The cost of this subscription service is £8.50 which works out at about £2.13 per blade plus your shipping is free of course and you get the razor blade handle with your first order which is quite good. Yes there are cheaper blades out there on the market but these ones are really good quality, even I'm thinking of signing up so I don't forget to buy razor blades anymore. Overall a really good idea to have a razor blade subscription service, it's convenient, the blades themselves and the handle are good quality which I'm giving the thumbs up and the price is definitely fair compared to other blades on the market. Women's blades especially as they can be so expensive. 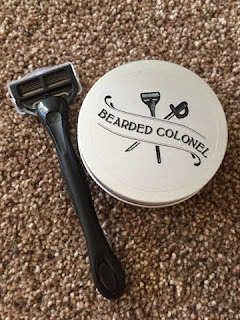 Please visit www.beardedcolonel.co.uk for more information. You can also see what Bearded Colonel get up to on Facebook and Twitter so why not pop over and say hello. I was provided with the first months subscription from Bearded Colonel in order for me to conduct this review. All opinions are my own. Well I can't quite believe that my gorgeous little girl is 4 weeks old already. Where oh where has the time gone!? 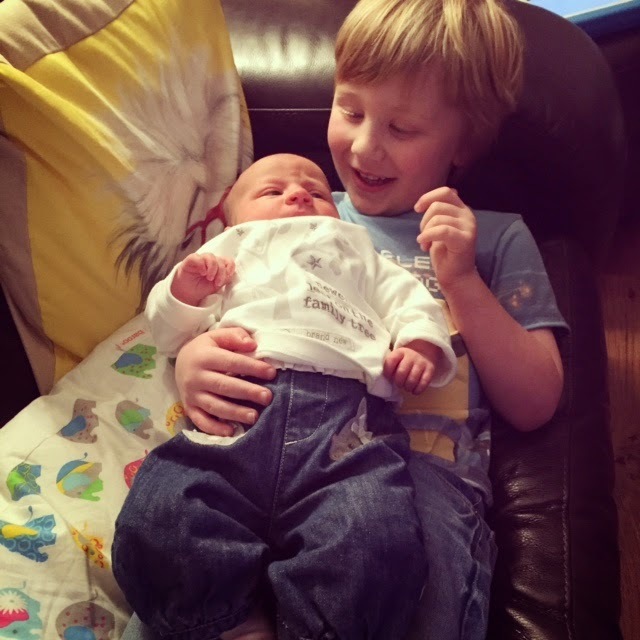 The last 4 weeks have been a whirlwind of feeding, nappy changes, visitors and basically trying to get into some sort of routine since Logan's at school and we don't want to have him unsettled too much. Harlow is growing like a weed and already weighs 9lb 10oz (as of Wednesday this week) up from her birth weight of 7lb 13.5oz. She's not too bad with her sleeping at night either waking maybe 4-5 times for a feed some nights but settling back down well so I'm managing to get some shut eye thankfully. This might change though, especially when she starts to take little growth spurts. 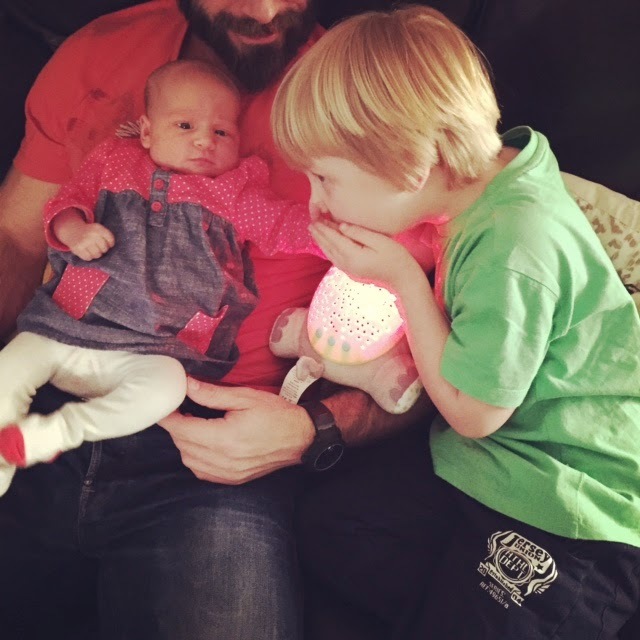 Luckily Logan has been very accepting of Harlow, he tries to give her some of his toys which is really kind and he wants to hold her (with supervision of course) and give her kisses and cuddles. He's had his moments mind you, especially when it comes to bed time. Everything will be going great until the last story finishes and then he'll beg for another story and another story, or he'll plead with you not to leave him along or shout "I need you!" which makes my heart bleed. I know he's just trying to get more attention and some nights he's fine but fingers crossed he settles down soon. It will be hard for him, any change at all is hard so a new baby in his life must be confusing. Since the weathers been better this week we've all managed to get out for some nice little walks, not very long walks as I'm still trying to take it easy with the c-section but getting some crisp fresh air has been wonderful. 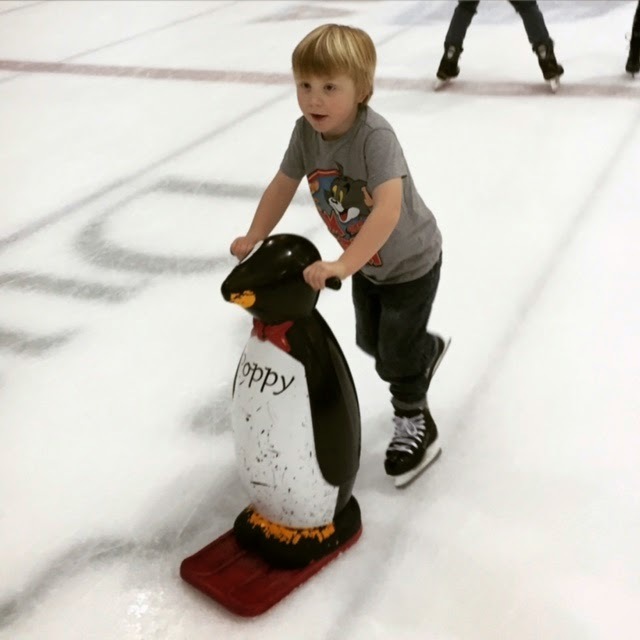 Logan has also taken to ice skating since our usual weekend activity of swimming had to take a back seat but he seems to be enjoying this. Harlow and I have watched from the side of course, we're not quite up to ice skating yet! Breastfeeding has been going really well and Harlow has been a natural from the start. I think it may be because I'm more relaxed this time round and not stressing or questioning myself as much as I did when Logan was born. Of course the birth was much calmer as well which will have helped. 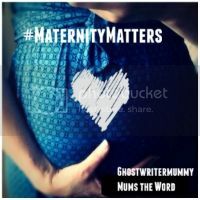 My health visitor said to me on her first visit that you never have your first baby again and this has been so true for myself and the other half. We're much more chilled this time round and don't panic or start sweating when Harlow cries ha ha! With Logan we were a bag of nerves. We haven't really been up to much else, just enjoying finally having our little girl here and to be honest it's like she's always been here. She's fitted in perfectly. 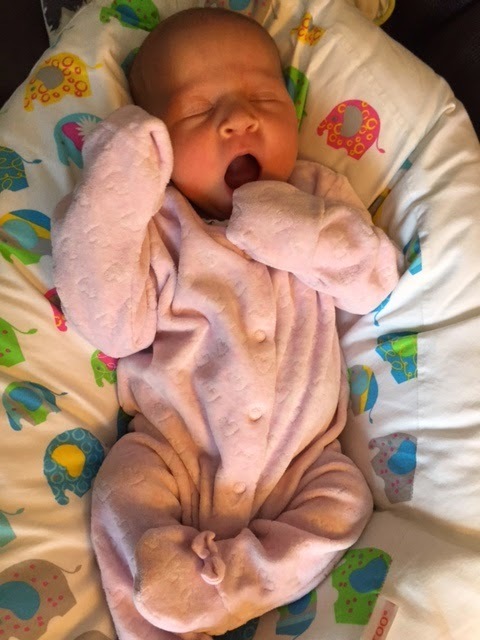 Baby sleep time can get a bit confusing with all the different factors you have to take into account. Is the room the right temperature, how many blankets should I use, cellular blankets or non cellular, what if baby kicks the blankets off, feet to foot etc. It's all a bit daunting especially if you're a first time parent, that's why I started using Grobags from The Gro Company. 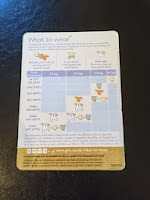 I used Grobags with my eldest who's 5 so when my baby girl came along I planned to use Grobags again. Harlow's been lucky enough to have been sent a Grobag to test and review from The Gro Company so here's what we thought. The Gro Company says: "The Gro Company is a Devon-based global nursery brand that has recently been acquired by its management team under a management buyout agreement. As an award-winning and industry accredited manufacturer of safer sleep solutions, we produce a range of much loved products for babies and young children. 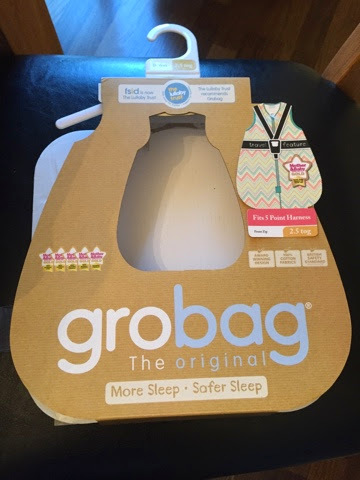 We are most famous for the multi-award winning Grobag, the No1 baby sleep bag brand in The UK and Australia which has changed the way babies are put to bed." 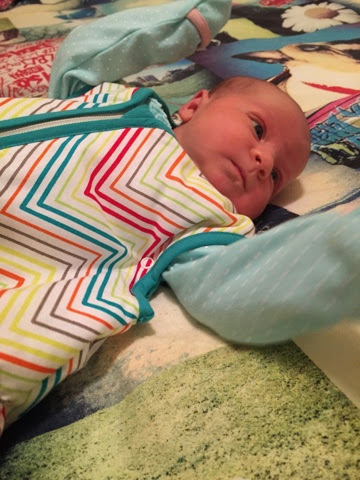 Harlow received the Tribal Travel Grobag to try which is suitable for a boy or girl due to it's unisex colours. It came packaged in a simple grobag shaped cardboard sleeve which has a wealth of information included on it. You can either recycle if you're used to using grobags or you can keep for future reference. 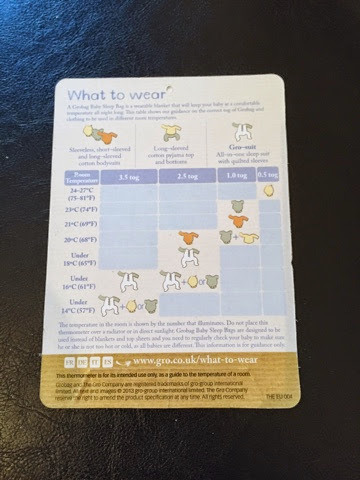 It tells you the correct sizing to suit your baby and it also tells you which tog rating to use. This is really useful and takes the stress out of making sure your baby is snug, safe and content. 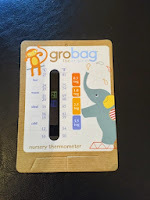 Included along with the grobag is a handy room/ nursery thermometer which of course tells you the temperature of the room but on the back it also tells you what tog to use for which temperature and what your baby should wear before being put in the grobag. 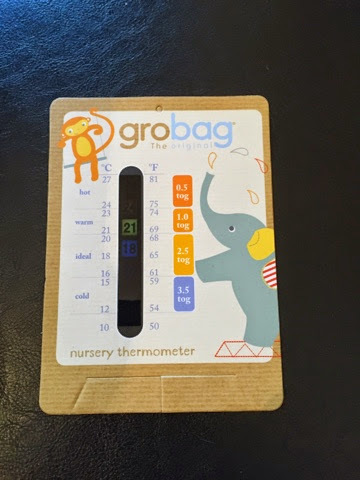 I love this thermometer and The Gro Company include it free for every 0-6 month or 6-18 month grobags, brilliant! Since this is a travel grobag it has a two way zip at the front and a little velcro opening at the back so it can fit a 5 point harness in a buggy or car seat. Very handy for when travelling around your baby's bed time and you want them to be snug but also want to move them into their moses basket/ cot without fuss or having to change their clothes. Even without the travel feature I still find it easier and more settling at night now to scoop Harlow up, give her a breast feed and put her back to her bed still snug and cosy. When she had blankets in her moses basket her bed would get cool without her being in it so when I put her back she would wake up. With the grobag she's still nice and toasty so settles back to sleep so much easier. It's lovely, she just seems more content. 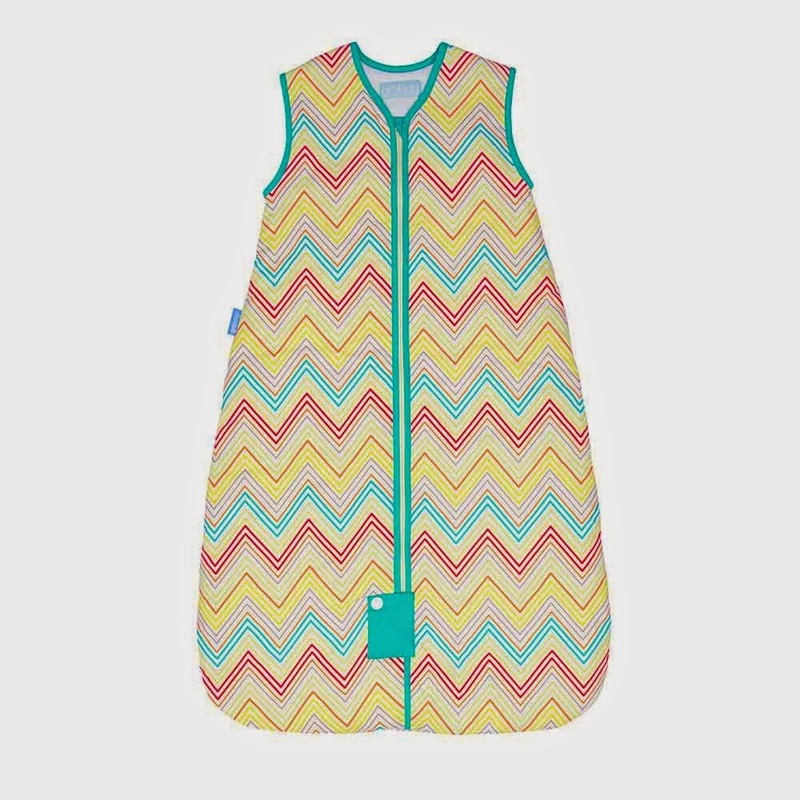 The Tribal Travel Grobag is available in a 2.5 tog and 1.0 tog warmth ratings, and is available in sizes 0-6 months, 6-18 months and 18-36 months. The 0-6 month size has handy under arm poppers which can be used for babies between 8.8lb and 10lb to stop their arms going back inside the grobag. 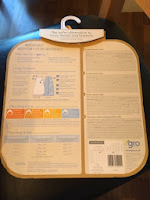 It's worth noting that your baby cannot use a grobag unless they are 8.8lbs in weight or over. This is for safety reasons i.e. 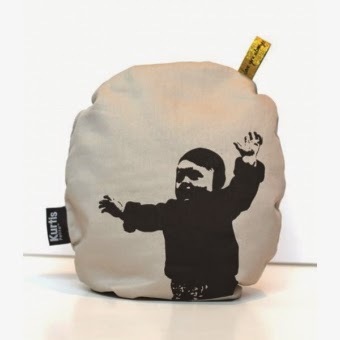 your baby's head may not be big enough yet so could slip into the grobag. I didn't use this grobag until Harlow was almost 9lbs just to be on the safe side. It fits her perfectly well now though and she's very happy in it. The 2.5 tog grobag has a quick dry polyester filling which is handy in the winter months since you can't really get your washing outside to dry but instead have to dry in the house. 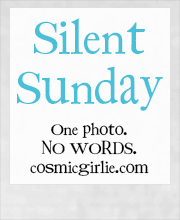 The 1.0 tog is 100% cotton throughout but both ratings can be tumble dried on a low heat. The prices for this grobag vary depending on the size so it's £25.99 for the 0-6 month, £28.99 for the 6-18 month and £30.00 for the 18-36 month. 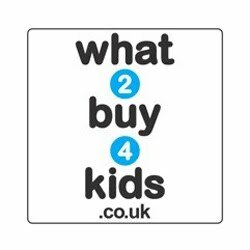 Sounds expensive however if your child is wearing their grobag every night (or almost depending on washing) then the wears per price makes it definitely worth it. Stockists include Mothercare and John Lewis and there's plenty of online stores or you can purchase directly from The Gro Company themselves. Overall I love Grobags, they make baby sleeping so much easier and safer and definitely give me peace of mind. They wash well and last the test of time. I even have all of Logan's old grobags from when he was little which he used constantly and Harlow will use them when she's big enough. I think the pricing is fair and they're an all round great purchase. A product which I'll definitely be recommending to friends and family. Please visit www.gro-store.com for more products and information. You can also see what The Gro Company get up to on Facebook and Twitter so why not pop over and say hello! I was provided with the Tribal Travel Grobag in order for me to conduct this review. All opinions are my own.